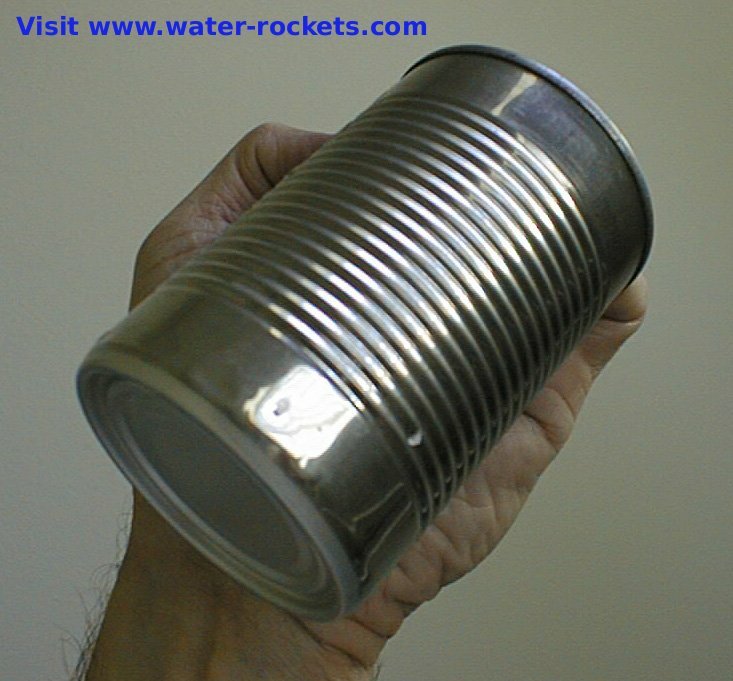 Here is the basic building block for our water-rocket motor: A deep-drawn steel soup can. These cans are a great improvement over the old juice cans of the past. 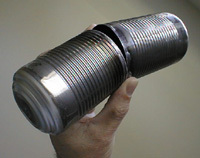 The lack of seams provides a much stronger pressure vessel for storing more fuel - compressed CO2 and water. 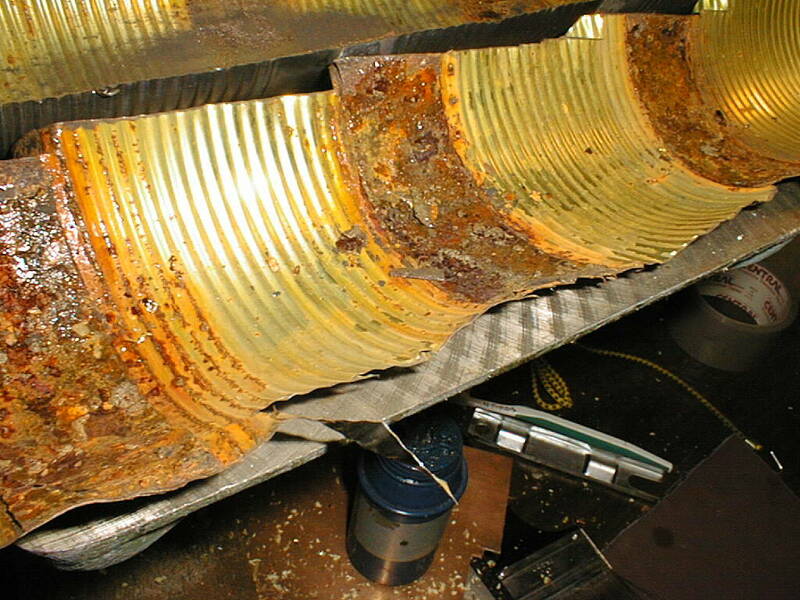 The use of steel for our motor casing, and the high operating pressure pose a very serious safety threat. Before using any motor we must know how much pressure it can safely contain. 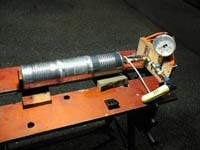 This picture shows a test motor that we deliberately ruptured to determine its pressure capacity. This test was conducted with the motor FULL OF WATER so that little energy was stored. The test was conducted inside a heavy wooden box to protect us from pieces of the motor when it ruptured. This assembly ruptured at 195 psi. 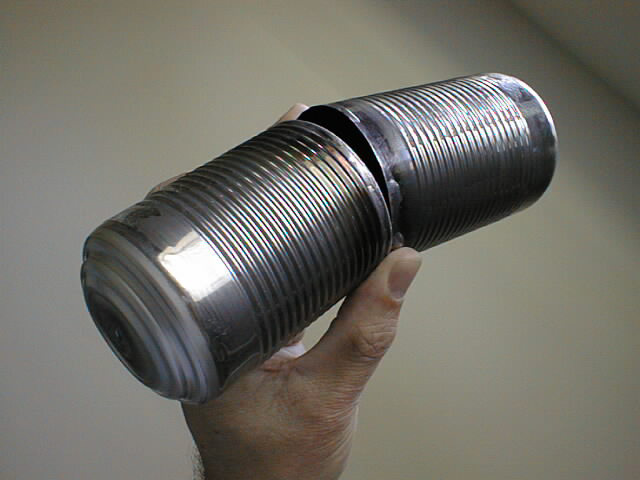 It broke along the soldered seam used to hold the two cans together in the center. Note the expanded ends of the cans. This motor made with a steel band inside the center joint did not rupture until 425 psi. The failure occurred next to the seam, not along it. Again, this test was conducted with the motor full of water, and within a heavy wooden box to protect us when it ruptured. The energy that produced this rupture was contained in a small bubble of CO2 within the motor. 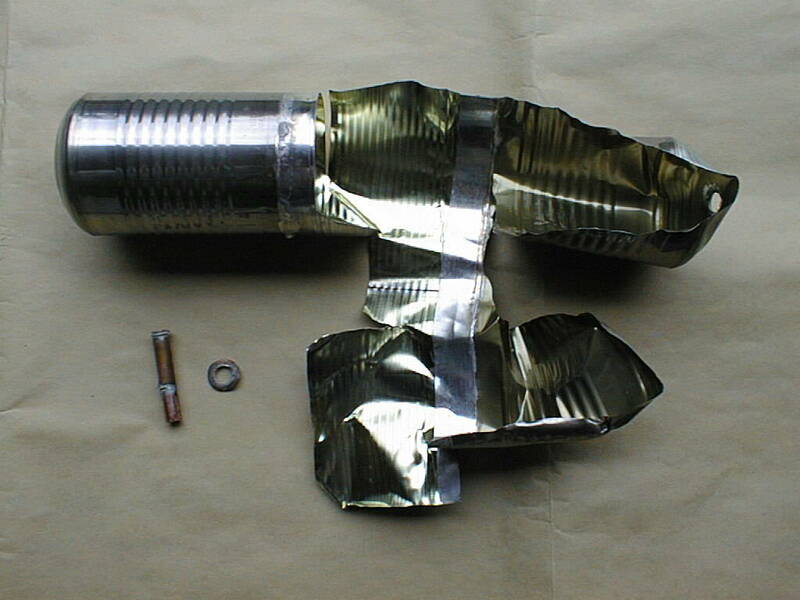 Here is the ruptured test assembly. 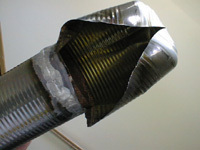 Note the copper tube and compression fitting required to contain the high-pressure gas/water. There was considerable violence inside our test box when this ruptured. We conducted another test of a motor constructed of 3 larger soup cans. As before, we filled the motor with water as completely as possible before pressurizing it. 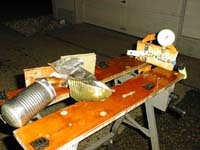 As pressure builds the motor bulges out at the ends. The bulges at the ends store a volume of CO2 that proved to be very energetic. As the pressure reached 400 psi we heard a loud pop, and our test box jumped. This is what we found inside! We were both stunned by the extent of the damage to the motor. Here are the parts of the motor. Notice that the nozzle and sear washer were blown off the motor casing. This damage was done by 2 or 3 in.3 of CO2... Imagine what would happen if this had been 60% full of CO2! All of the testing described so far was conducted on freshly assembled motors. The motor shown here was fabricated, and left to sit for a couple months with a little bit of water inside. 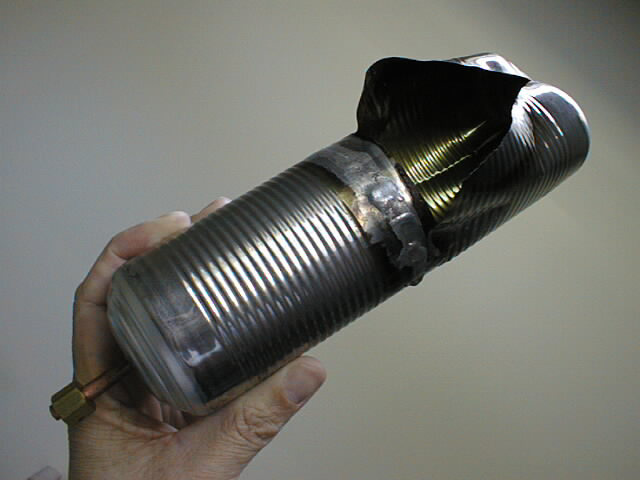 When pressurized it sprung pinhole leaks near, but not on, the seams. 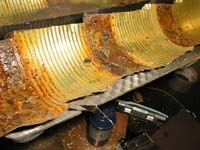 When we cut it open we discovered the reason: rust. The enamel coating on the inside of the cans is burned away by the torch during assembly, leaving the steel and solder joint open to the water and air. Needless to say, corrosion of this severity will seriously reduce the strength of the joint. We noticed the leaks at about 150 psi. Had we been able to go higher, it would have ruptured at a lower pressure than a fresh motor.